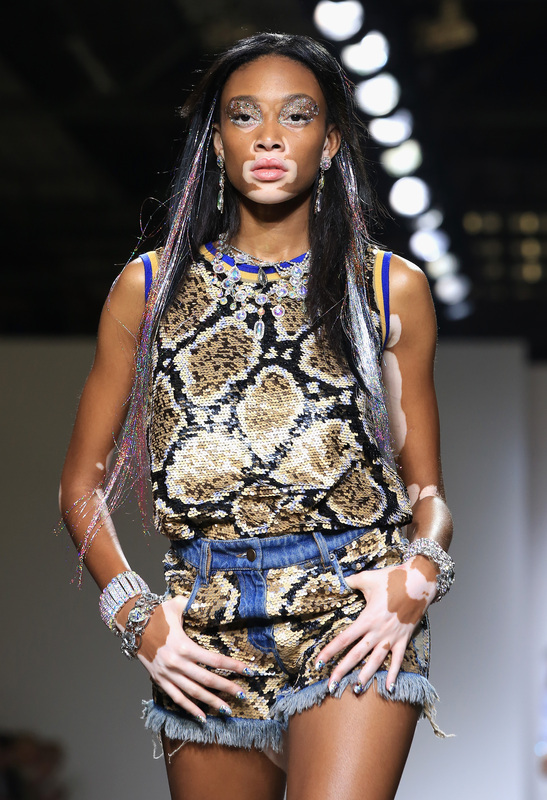 Another win for unconventional but totally undeniable beauty: former America's Next Top Model contestant Winnie Harlow is starring in Diesel's Spring/Summer 2015 ad campaign. In addition to her talent, the Canadian stunner has been creating buzz within the fashion industry and beyond for her unique skin. Harlow has vitiligo, a condition affecting pigment that has left her with white patches all over her body. Despite not fitting the mold of what society calls "traditional beauty," Harlow has been killing it with her self-love mottos and her serious modeling skills. The model, whose real name is Chantelle Brown-Young, has been inspiring women everywhere to not only accept the way they look, but to embrace themselves just the way they are. After finally being eliminated in episode 13 of ANTM 's 21st cycle, Winnie's been making major headway in the competitive modeling industry, walking in Ashish's London Fashion Week show last fall and starring in several Desigual campaigns.